Happy Snow and Slick Road Day! Honestly, I didn't see that coming! I'm super excited. My running is coming along smoothly. I just got a bottle of Runners Choice Oil for sore feet. Be on the look out for a review and a giveaway! However, today I want to focus on one of the running tools that I recently have the opportunity to use and review. 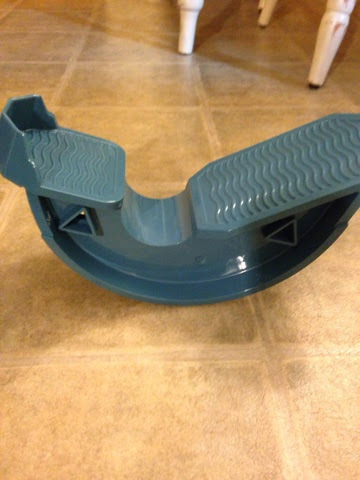 I love The North American Health Care Foot Rocker relieves lower body pain quickly, safely and easily with a rocking stretch. This one size fits all rocker is designed to position your foot optimally, so you can work and stretch muscles, tendons and ligaments of your foot or lower legs by simply following the three, 30 second stretch intervals. This reduces and relieves pain associated with plantar fasciitis, Achilles tendonitis, ankle strain, arch pain, calf pain or foot pain in general. 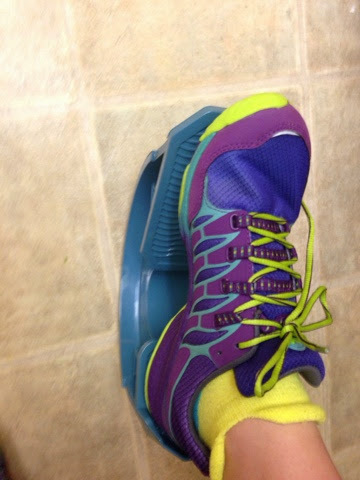 Honestly, it stretches my calfs like no other and I'm not having to stretch my feet and the stairs 100x knowing they aren't completely stretched. I love this product! I can stretch while texting, sending an email or watching TV as I'm standing. Note, make sure to stand in a sturdy place and even surface. It's super easy to use, lots of ways to use it and it's a reasonably prices product for a great tool to help those running feet get relief! This product is awesome and I highly recommend! Afterall, feet are important for running and so are your ankles. Why not take care of them. Q: How do you take care of your feet and ankles?